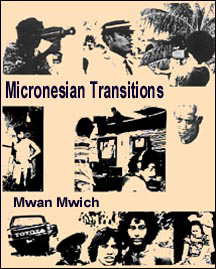 Part of the "Micronesian Transitions" videotape series from 1977 to 1983, this program presents festive dances at Mwan Village on Moen Island, Truk (Chuuk) which were performed in celebration of the inauguration of Erhart Aten, the first governor-elect. The wide range of dance styles at this mwich or "meeting" exhibits the influence that many countries and islands have had on Trukese culture, including Spain, Germany, Japan, the United States, Samoa, and Ponape (Pohnpei). Producer: Xavier High School, Truk. Director: Eric Metzgar, Instructor. Senior Town Study Project students: Nickson Bossy, John S. Deleon, Ohner Jim, Kris Johnson, and Jacinta Rickat.